With an abundance of scenic and shoreline views—plus relatively flat topography—Richmond is a biking hotspot for cyclists of all skill levels. And with more than 80 kilometres (50 miles) of designated routes, you’ll also discover lots of camera-worthy urban, historic and nature-loving pit-stops en route. From downtown Richmond, cycle west on Granville Avenue to the off-road trail that runs alongside Railway Avenue. This path was once a railway track before being converted into a grass-fringed, multi-use trail for walkers and cyclists. Heading south, the route has no steep gradients and is fully paved, making for a smooth and comfortable ride. You’ll soon reach the eastern edge of Steveston; continue into the village centre and head towards the scenic waterfront. From downtown Richmond, make your way west, along Cambie Road towards the water, joining the Middle Arm Dyke Trail that runs alongside River Road. On this scenic, shoreline-tracing trail, you’ll pass the John M. S. Lecky UBC Boathouse and Richmond Olympic Oval before finally reaching Terra Nova Rural Park where boardwalks, bird habitats and camera-hugging nature views await. This route is dominated by Fraser River vistas, framed by the region’s distant mountains. From Steveston&apos;s Fisherman&apos;s Wharf area, follow the riverfront path eastwards through Imperial Landing Park to Britannia Shipyards National Historic Site. Check out this popular attraction then continue eastwards along Westwater Drive to Dyke Road and its adjacent South Dyke Trail. Follow this shoreline trail to London Heritage Farm. After exploring the house and gardens here (afternoon tea is also available), continue further along the trail. Head past No. 3 Road Pier—stop to watch the anglers—then cycle on to Finn Slough, a small community of float homes and wooden houses on stilts. The trail continues from here for a few more kilometres; extend your exploration or wind your way back to Steveston. From the Steveston waterfront, ride west past the Gulf of Georgia Cannery National Historic Site to Garry Point Park, with its dramatic Fraser River panoramas (make a note to return later for a picnic or sunset photos). After winding around some of the park’s trails, connect to the West Dyke Trail and cycle north. This route runs all the way to Terra Nova Rural Park, one of Richmond’s most popular nature spaces, complete with tree-lined trails and an abundance of local and visiting birdlife. From here, you can wind back to Steveston or continue on the Middle Arm Trail to downtown Richmond. Many of our biking routes are also popular with walkers. For further information on Richmond’s cycling scene—including a local route map—click here. 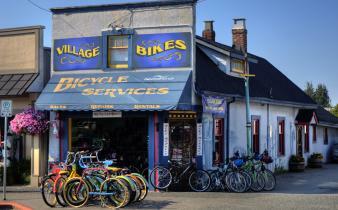 Village Bikes—located in Steveston—offers hourly and daily bike rentals that include a helmet and a lock. 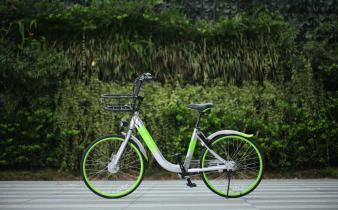 There is also a bike share program in the city called U-bicycle—their bright green bikes can be spotted at bike parking locations across the city. Click here to download the U-bicycle brochure for more information on how the program works.